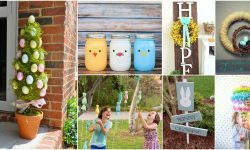 Easter crafts don’t have to be complicated. They can be super thrifty, fast, easy and fun. 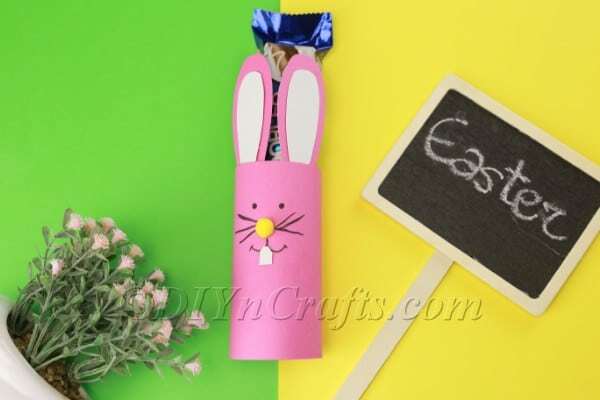 In this video tutorial, find out how you can make an Easter bunny candy holder using regular construction paper. Whether you are looking for a fun kids’ activity for your classroom or for your own children at home on a rainy spring day, this project is the perfect choice. 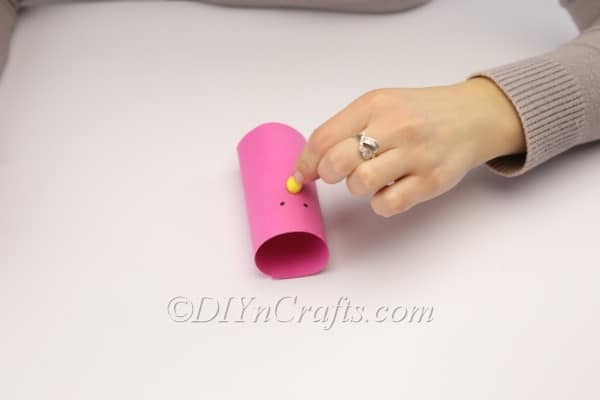 In this video tutorial, we will be making bunny candy holders for Easter using construction paper. 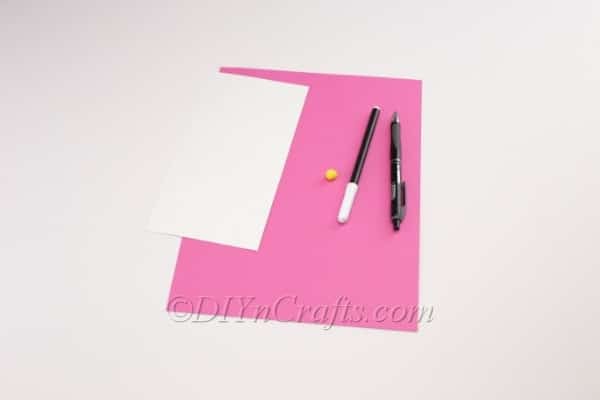 Aside from the construction paper itself and a pom-pom, all you are going to need is a black marker, a pencil, a pair of scissors, and hot glue and a glue gun or a different glue product of your choice (such as a glue stick or liquid glue). You do not need to use the same colors that I did. I just have listed them with the materials below as an example. 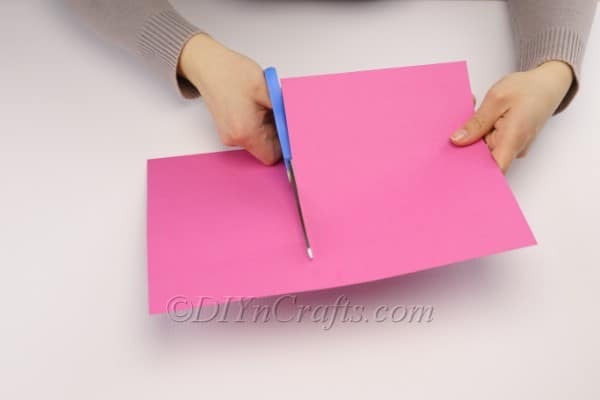 You can pick any colors of construction paper you would like, as well as any color of pom-pom. Do make sure you have a little bit of white paper for the bunny’s teeth. If you have your materials and supplies ready, we can go ahead and get crafting! Watch the video tutorial and read the written directions as you follow along. 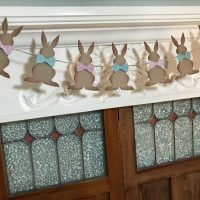 Love construction paper crafts, and looking for an easy and fun one to celebrate Easter? 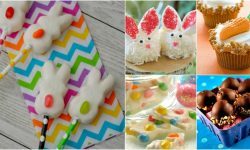 In this video tutorial, discover how you can turn construction paper into an adorable Easter bunny candy holder. 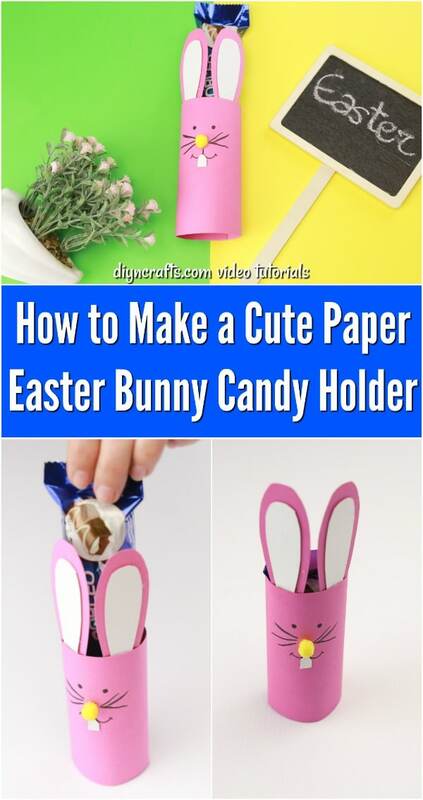 To get started, decide how large or small you want your bunny candy holder to be, and then cut a rectangle out of a piece of construction paper (I used pink). 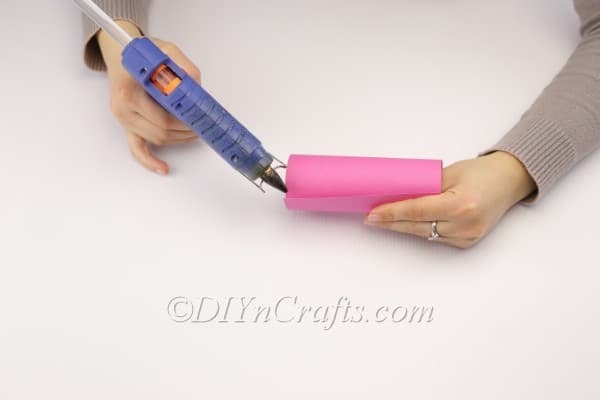 Once you have the rectangle cut out, wrap around one end to meet the other, and glue those together so that you have a cylinder. This will be the container for the candy. Now we are going to decorate it so that it looks like a bunny. 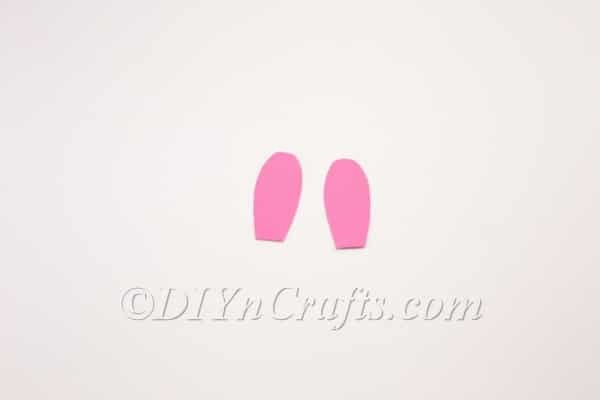 To begin with that task, cut out two matching bunny ears from the same color of construction paper (again, pink, in my case). You now need to make the inner ears to go with the outer ears. Cut another pair of matching ear-shapes from the white construction paper, but make them slightly smaller. You can set aside the ears for now, and return to working on the cylinder. Making the bunny’s facial features is easy. Start by drawing two little dots with a black marker to serve as the eyes. Then glue on the small pom-pom as the bunny’s nose. Pick up the black marker again and draw the bunny’s whiskers extending to either side of the nose. Draw the mouth below the nose. Cut a small rectangle of white paper and glue it on top of the mouth, extending down from under the nose. Glue the inner ears onto the outer ears. Finally, glue the ears to the top of the cylinder. It will look best if you attach them to the inner edge of the front of the cylinder rather than the rear. This is especially true once you add the candy. If you glue the ears to the rear, the candy will cover them up, but if they are in the front, they can easily be seen. 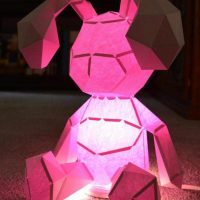 Once you finish making your bunny, you can set it out to display, and put some candy inside! 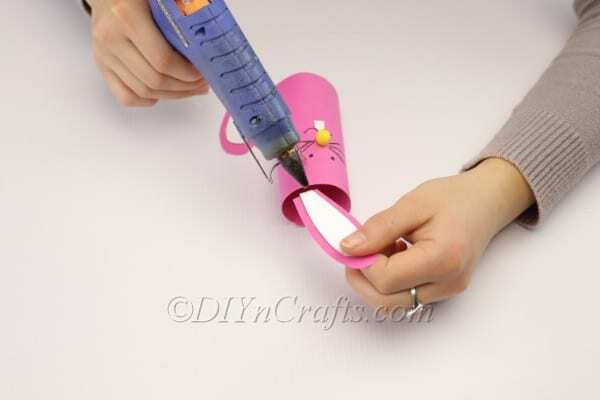 This project does not have you creating any sort of bottom for your tube of construction paper. So this is a candy holder designed to be sitting upright, for example on a desk. If you try to carry candy in it, unless your hand is on the bottom, the candy will just fall right through. 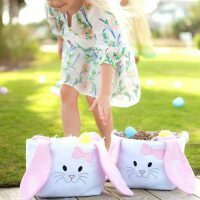 The best type of candy to store in this particular Easter bunny candy container is anything tall, for example, candy bars. These will stick out enough at the top that people will be able to see that there is candy inside your container. Plus, small candies would not really be practical for this candy holder. Any time you wanted to move the container, you’d have to be very careful not to spill everything out the bottom. Where can you put one of these candy holders? The answer is, of course, “anywhere.” But I think that one would look particularly cute sitting on your desk at work or in the classroom. 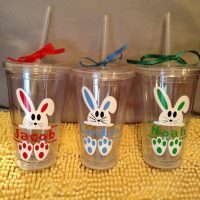 In these environments, you not only can use the bunny as a candy holder but as a pen holder as well. 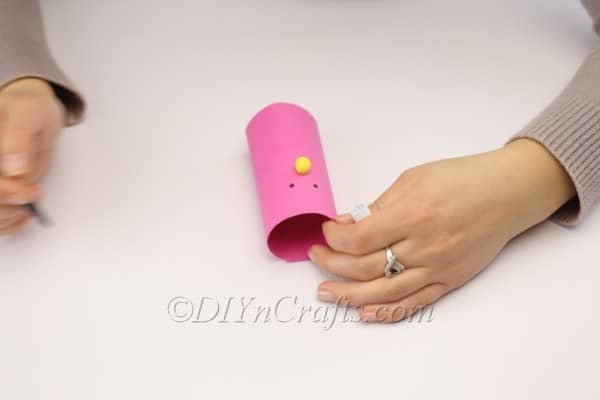 If you had a fun time doing this craft, there is another on the site which I think you will have a fabulous time with. 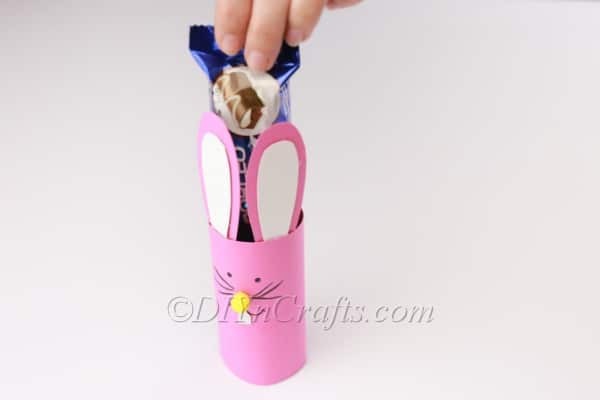 Here is the link to the tutorial and free printable to make a different DIY paper Easter bunny candy holder. I mentioned that I thought that the bunny candy holder you just learned how to make might make a nice decoration for a desk at work. 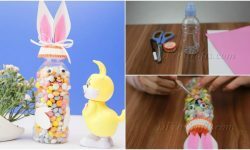 Another work-friendly DIY Easter décor project which you may want to check out as well is this one to make a colorful candy vase. 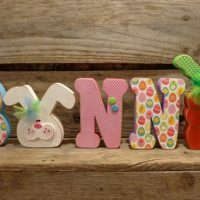 Another way you can spruce up a desk (or any other item of furniture you want to decorate for Easter) is to turn any photograph of your child into a cute Easter bunny. 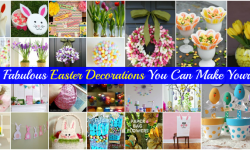 You also might want to give this DIY Easter décor project a try. 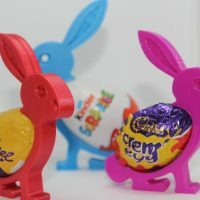 In the tutorial, you’ll discover how you can make a tiny Easter basket which fits just one egg. 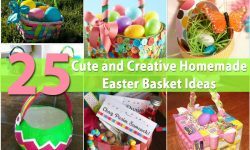 Every Easter project on our site uses simple, ordinary craft supplies which you can easily find at a regular store if you do not already have them at home. The steps are fast and easy so that anyone can do them. 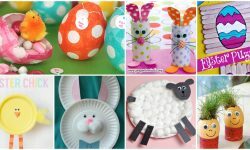 Have fun with these simple Easter craft projects, and check back again soon to see what fresh tutorials we have added. 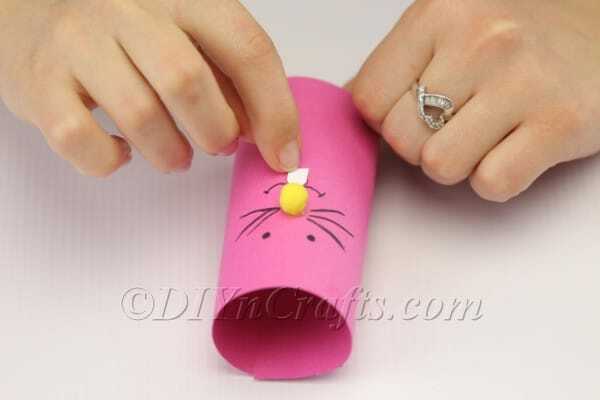 I’m making the toilet paper roll Easter Bunny for my senior craft room friends, and adding a small candy bar in each bunny’s. Cute!